As an editor and indexer, I often deal with texts that use diacritics to transcribe Arabic. In parts 1 through 4 of this series (Romanized Arabic in English Texts, Part 1 — Sources of Variations; Romanized Arabic in English Texts, Part 2 — Other Challenges for Editors; Romanized Arabic in English Texts, Part 3 — Spelling the Definite Article; Romanized Arabic in English Texts, Part 4 — Omitting, Capitalizing, and Alphabetizing the Definite Article), I often mention the use of special characters, but until now I have not explained how to put them in your Word document. In Part 5, Romanizing Arabic in English Texts — Part 5: Inserting Symbols and Creating Shortcuts, I discuss how to insert symbols and create keyboard shortcuts. In this part, I discuss how to use AutoCorrect and FRedit for special characters. Thanks to Geoff Hart and his Effective Onscreen Editing, for this method (and I highly recommend his book for all editors and writers). Go to the Insert tab and Symbol menu. Choose the font and subset. Find and select the character you need. Click on AutoCorrect in the lower left. In the Replace box, type some combination of keystrokes that will be easy to remember — usually best encased in some form of brackets — and then click on OK.
Now every time you type that combination, it will change to the special character you want. In my example, I chose [n-] to AutoCorrect to ñ (Unicode 00F1). If you don’t want the keystroke combination to change in a particular instance, just type Ctrl + Z (Undo). You can repeat this with all the special characters you need. In the screenshot, you can see some of the other AutoCorrect combinations I have created for the work I do. It is sometimes difficult to find the characters you need in the Symbols table. If you have the Unicode values of the characters you need from your publisher or another source, you can also access AutoCorrect from the Word Options dialog box. First, collect all the symbols you need and their Unicode values, either in another document or in your current document. I have collected all the Unicode characters that I use in one file, with their Unicode values, and the AutoCorrect coding that I use. 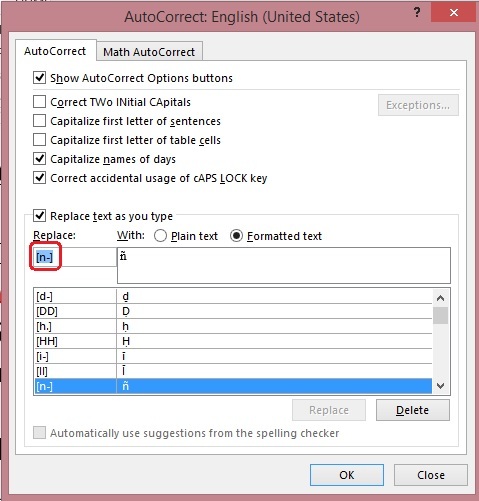 If you are working in Word 2010 or a later version, go to the File tab > Options > Proofing > AutoCorrect Options. If you are working in Word 2007, use the Office button to get to Word Options. Then follow the steps above to create AutoCorrect codes for each character, using copy-paste to put the character in the With box. Another useful trick I learned from Geoff Hart’s book is how to identify a special character in a document that I am editing. Put your cursor immediately after a letter and hit Alt + X. The letter will change to its Unicode value. Hit Alt + X again and the character will appear again. You can also use this method to insert a special character. Type the code and then Alt + X. If your special character is to come immediately after a numeral (such as if you are inserting a degree symbol), insert a space after the numeral, then delete the space after you insert the special character. Allen Wyatt gives more details on this in his Word Tips. Being able to identify a character this way is handy if you come across an odd-looking character, or if you want to check whether your author has used the correct characters. There are various similar-looking characters to represent Arabic ayn and hamza, and I often have to check them. I can use the FRedit macro to highlight either the correct or incorrect characters as I find the need. FRedit is a free macro available from Paul Beverley at Archive Publications. The FR is for Find-Replace. Paul has also provided videos to show you how to use this and other macros he has written. You can use FRedit to replace your codes with special characters, similar to the way you would do it with AutoCorrect. The difference is that in using FRedit, your codes can be case-sensitive and your changes will not be made immediately as you type but later, when you run the macro. Collect all the special characters and your codes in one Word document to be used any time with FRedit. When I have used editing software to check for inconsistencies, it did not recognize the difference between a plain letter and the same letter with a diacritic on it. I told Daniel Heuman of Intelligent Editing Ltd., creators of PerfectIt, about this, and sent him a sample file and a list of Unicode characters that I use for Arabic. He recently wrote to me to say that they had fixed the bug that caused this problem. I have tested it briefly and it is not quite right, but I will work with Daniel on this. With a combination of PerfectIt and FRedit, you should be able to catch most inconsistencies in files with special characters. If you are editing rather than writing, you can use FRedit to automatically highlight — or, if you prefer, change to a different color — all of the special characters in a document. I find this useful because it draws my attention to the characters and makes it easier to see if a word is spelled once with a diacritic and once without, or if a different character was used. If you are already familiar with FRedit, this image from the macro library will be understandable. This macro highlights all of these characters in yellow. I added the ones I needed to the ones provided by Paul. You could write similar macros that would highlight all of the single open quotation marks (sometimes used for ayn) in a second color and all of the apostrophes (sometimes used for hamza) in a third color — but note that it will also highlight these characters when they are used for other purposes. Remember that I said there is more than one way to stick a macron on a letter? I was editing a document with a lot of transcribed Arabic titles at the time I was learning to use FRedit. I used the macro to highlight the Unicode special characters of my choice and was surprised that some letters that clearly had macrons were not highlighted. Using the Alt + X trick, I discovered why: A different character — a macron alone — had been used on those letters. They had to be changed to the correct Unicode character. FRedit made it easy to see which characters needed fixing because they were left unhighlighted. 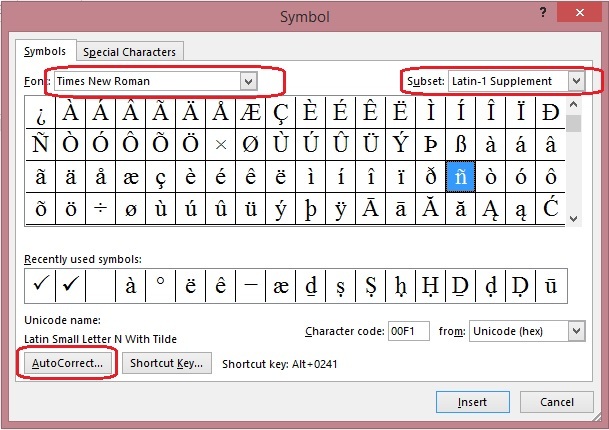 You should now find it easier to use special characters in Word. In Part 5, I explained how to insert special characters by using the Insert Symbol feature and by creating keyboard shortcuts, which are suitable if you do not need a lot of different characters. In this part, I have explained two methods to use when you need a lot of different special characters. With AutoCorrect, you create codes that change to the desired special characters as you type. With FRedit, you create codes that change to the desired special characters when you run the macro (at the end or periodically as you work on a long file). You can also use a FRedit macro to highlight special characters so you can spot inconsistencies more easily in spelling and see any characters that look like the ones you want, but are in fact something else.